Have you already provided project management training or courses and would like to extend these activities, as well as achieve a more professional image through IAPM certification? As "Certified Project Management Trainer (IAPM)" you can prepare course participants for IAPM certification examinations using exclusive course materials that are only made available to our certified trainers. Currently, trainers can hold preparatory courses for the following certifications: "Certified Junior Project Manager", "Certified (Senior) Project Manager", "Cert. Junior Agile Project Manager", "Certified (Senior) Agile Project Manager" and "Certified International Project Manager". The trainer has to have the highest available IAPM certification in a specific field of project management in order to provide courses with that specialisation. You decide what specialisation you would like to offer as trainer. The IAPM has traditional project management certifications (Certified Junior Project Manager, Certified Project Manager, Certified Senior Project Manager), agile project management certifications (Cert. Junior Agile Project Manager, Certified Agile Project Manager, Certified Senior Agile Project Manager) and an international project management certification (Certified International Project Manager). You can select one, two or all three specialisations for your trainer certification. If you want to prepare people for the IAPM’s traditional project management certifications, you will need Certified Senior Project Manager (IAPM) certification. If you want to prepare people for the IAPM’s agile project management certifications, you will need Certified Senior Agile Project Manager (IAPM) certification. 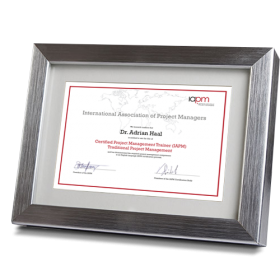 If you want to prepare people for the IAPM’s international project management certification, you will need Certified International Project Manager (IAPM) certification. This confirms to the IAPM that you have adequate knowledge and experience in one or several fields to hold courses. To be a trainer, you have to score at least 75% in your certification test. If you have IAPM certification in your chosen field, click here to register for "Certified Project Management Trainer (IAPM)" certification. You will be redirected to a form where you have to state the number of hours that you have worked as a trainer/lecturer/teacher etc. in the last five years, list up to 5 courses with names and content, numbers of participants, reference providers, durations and clients, as well as information about the approximate total number of people who have attended all your courses to date. If you have a certificate from another project management association in one of the fields that you would like to work in as trainer, you can request certificate recognition. If your certificate is recognized, once you have filled out this form you will have to take the corresponding IAPM certification examination. The examination fee is included in your trainer fee. You don’t incur any additional costs for taking the certification examination! It allows the IAPM to ensure that all its trainers, even the ones with certificates from other organisations, satisfy its high knowledge requirements. You have to achieve a minimum score of 75% in the examination. Your registration details are then checked by the IAPM. If you satisfy all requirements, you will be sent an e-mail invoice which you have to pay within 30 days. When your payment is received, the certificate will be delivered to you by e-mail. Then you will have life-long verification of your competence as trainer in your certified project management field. What does the "Certified Project Management Trainer (IAPM)"
Who is "Certified Project Management Trainer (IAPM)" certification intended for? "Certified Project Management Trainer (IAPM)" certification is for anyone who would like to give courses in traditional, agile and/or international project management that prepare people for IAPM certifications. Proof of experience as trainer/lecturer/teacher has to be provided. What are the advantages of having "Certified Project Management Trainer (IAPM)" certification? "Certified Project Management Trainer (IAPM)" certification verifies that your knowledge and competence have been tested and confirmed by the IAPM International Association of Project Managers, an independent and international project management organisation. When bidding for training contracts, being a member of an expert network like the IAPM can be a decisive advantage. The IAPM also sends enquiries about training partners directly to its certified trainers. What does the "Certified Project Management Trainer (IAPM)" certification cost? "Certified Agile Project Management Trainer (IAPM)" for the IAPM’s agile certifications, "Certified Traditional Project Management Trainer (IAPM)" for the IAPM’s traditional certifications and "Certified International Project Management Trainer (IAPM) for the international certification. The costs depend on which and how many of the trainer certifications you want to obtain. If you scroll up there is a function that will show you how much the certifications cost. There will be additional costs for IAPM certification examinations or certificate recognition, which you will need before you can apply for a trainer certificate. What are the requirements for a "Certified Project Management Trainer (IAPM)" certificate? If you want to train people for traditional IAPM certifications (Certified Junior Project Manager (IAPM), Certified Project Manager (IAPM), Certified Senior Project Manager (IAPM)) you will have to obtain Certified Senior Project Manager (IAPM) certification (with a score of at least 75%). If you want to train people for agile IAPM certifications (Cert. Junior Agile Project Manager, Certified Agile Project Manager (IAPM), Certified Senior Agile Project Manager (IAPM)) you will have to obtain Certified Senior Agile Project Manager (IAPM) certification (with a score of at least 75%). If you want to train people for international IAPM certifications (Certified International Project Manager (IAPM)) you will have to obtain Certified International Project Manager (IAPM) certification (with a score of at least 75%). The number of hours that you have worked as trainer/lecturer/teacher etc. in the past five years. A list of 5 courses with course name and content, number of participants and reference provider, duration and client. Total number of course participants (approx.). You can also request the IAPM to recognise an equivalent certificate from another project management association. However, if you opt for certificate recognition, you will still have to take the relevant IAPM examination and achieve a score of at least 75%. The examination fee is included in the trainer fee. You do not incur any additional costs for the certification examination, and it helps the IAPM to guarantee that its trainers all satisfy its high knowledge requirements. 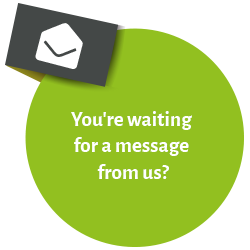 If you select this option and your certificate has been recognised by the IAPM, fill in this form and we’ll send further information to you by e-mail. You’re very welcome to contact us if you would like us to answer any further questions about the "Certified Project Management Trainer (IAPM)" certification.